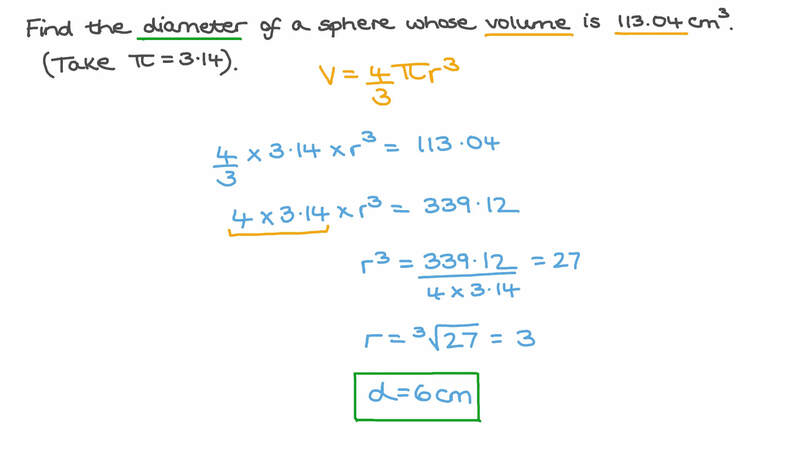 In this lesson, we will learn how to find the volume of a sphere or a hemisphere given its radius and how to use the great circle of a hemisphere to find its volume. The radius of a sphere is 3 √ 7 0 8 cm. Find its volume in terms of 𝜋 . What is the volume of a sphere whose diameter is 30? Find the diameter of a sphere whose volume is 113.04 cm3. (Take 𝜋 = 3 . 1 4 ). Which of the following formulae could be used to calculate the volume of the sphere? 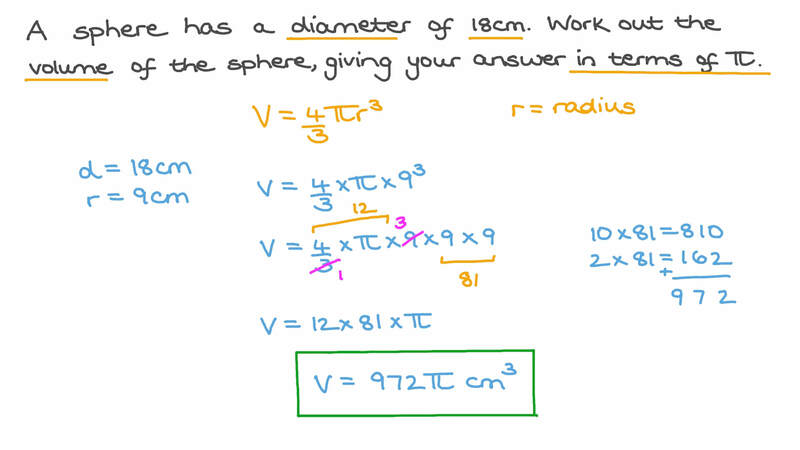 Work out the volume of the sphere, giving your answer accurate to two decimal places. A sphere has a diameter of 18 cm. Work out the volume of the sphere, giving your answer in terms of 𝜋 . A football can be modeled as a sphere. If the football has a diameter of 20 cm, calculate its volume using this model, giving your answer accurate to two decimal places. Find the volume of a sphere whose diameter is 4.2 cm. Use 𝜋 = 2 2 7 . Find the radius of a sphere whose volume is cm3. The volume, 𝑉 , of a sphere in terms of its radius, 𝑟 , is given by 𝑉 ( 𝑟 ) = 4 3 𝜋 𝑟 3 . Express 𝑟 as a function of 𝑉 and find, to the nearest tenth of a foot, the radius of a sphere whose volume is 200 cubic feet. Three-quarters of the volume of a sphere is 7 2 9 𝜋 cm3. What is the radius of the sphere? A sphere with a volume of 2 3 0 4 𝜋 cm3 is placed inside a cube. Given that it touches all six of the cube’s faces, find the volume of the cube. Find the edge length of the smallest cube in which a sphere of volume 2 3 0 4 𝜋 cm3 fits. Find, to the nearest tenth, the volume of a sphere given that the circumference of its great circle is 9 0 𝜋 in. Find, to the nearest tenth, the volume of a sphere given that the area of its great circle is 4 0 0 𝜋 in2. Maged opens a new 2 litres tub of ice cream and has three spherical scoops for dessert. Given that each scoop has a diameter of 40 mm, how many more whole scoops can he get from the tub? Karim makes an ice cream cone with two spherical scoops of ice cream. Before he has time to eat the ice cream it melts and fills the cone up to the very top. Given that the cone has an internal height of 14 cm and an internal radius of 3 cm, what is the radius of a scoop of ice cream? Two spheres have volumes of 1 6 2 𝜋 and 3 , 0 7 2 𝜋 cubic centimeters. What is the ratio of the radius of the small sphere to that of the large one? A sphere of metal with radius 14.1 cm was melted down and formed into 4 equal spheres. Find the radius of one of the smaller spheres, giving your answer to the nearest centimetre. A metal sphere of diameter 4 cm was melted down and reformed into a cylinder with a base radius of 6 cm. Find the height of the cylinder. A cuboid of lead has dimensions 154 cm by 48 cm by 42 cm. The cuboid is melted down to form a sphere. Using the approximation 𝜋 = 2 2 7 , find the radius of the sphere formed. A hollow sphere of metal has an internal radius of 1.8 cm and an external radius of 2.2 cm. One cubic centimetre of the metal weighs 30 g. Using the approximation 𝜋 = 2 2 7 , find the mass of the sphere. A cylindrical tank with a radius of 3 feet is partially filled with water. A spherical ball with a radius of 2 feet is dropped into the tank. Assuming that the sphere is completely submerged and the cylindrical tank does not overflow, find the height, ℎ , by which the water level rises. Give your answer to two decimal places.